This is a first protest this year at Saratoga. 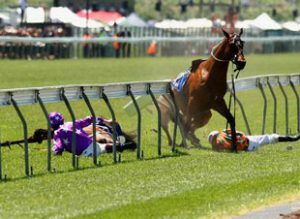 Stand with other animal advocates to protest the brutal business of horse racing. Click on the Protest Facebook Page for details and for details/dates of all protests organized by Horseracing Wrongs during Saratoga’s 6-week racing season. 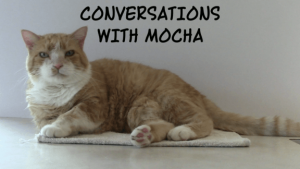 Email info@nyshumane.org if you have additional questions. Read the May 18, 2016 article in The Times Herald Record. 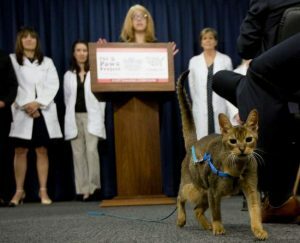 New York State Humane Association strongly supports this ban and is very much opposed to declawing of cats. Please let the sponsors know that you support their bills and want to see them move through for an Assembly and Senate vote. Click their names for contact information. Animal cruelty is linked directly or indirectly with every type of violent crime and even with most non-violent crime. Human beings would benefit enormously if fighting animal cruelty (investigating, prosecuting) were taken seriously. Many human lives would be saved and much human suffering would be prevented. PDF available to download. Governor Cuomo has signed this bill (A.7207/S.5320) into law requiring the NYS Department of Agriculture and Markets to work with the Municipal Police Training Council and the Division of Criminal Justice Services to develop training and training materials regarding the enforcement of the animal cruelty laws for police, and also to provide written and electronic information regarding the cruelty statutes for police agencies and officers, and district attorneys. This is very important because even though police are mandated to enforce Article 26 of the Agriculture and Markets Law (encompassing the majority of New York’s anti-cruelty laws), most of their training focuses on Penal and Criminal Procedure Laws. Currently, provisions related to animals are not routinely taught in academies. Now, thanks to passage of this bill, law enforcement will have the training needed to more effectively handle cases of animal cruelty, creating better outcomes for the animals and people of New York State. 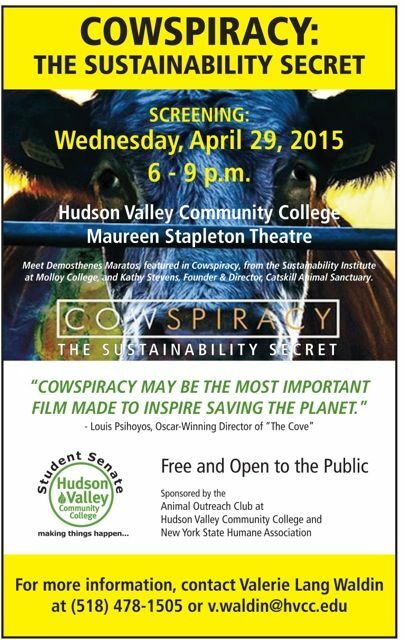 This film has been rescheduled a second time It will be shown on Wednesday, April 29, 2015 at 6:00 pm at Hudson Valley Community College’s Maureen Stapleton Theater in Troy. FREE and open to the public. We hope you will join us to view this important and revealing film. Instead of shopping at amazon.com switch to smile.amazon.com. 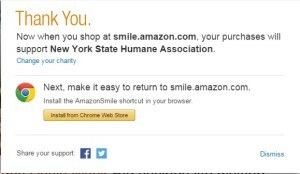 The prices are identical but Amazon will give .5% of the purchase price to a charitable organization of your choosing – we’re hoping you’ll choose New York State Humane Association! Thank you for your support!